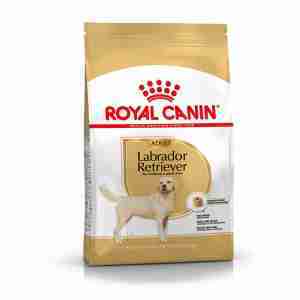 Royal Canin Labrador Retriever Adult is specially designed to help your Labrador stay at their ideal weight, while also being great for their overall health. Labradors are well known for being friendly and fun. Unfortunately, they are also more likely to put on weight than some other dogs. It can be hard to spot if your dog is getting bigger as it can happen slowly over time. When you’re out for a walk, or playing with your dog, watch how they behave. If they're easily tired, or want to play less, it could be because they're overweight. If your dog is overweight, they could be at risk from a number of nasty health problems, including diabetes, arthritis, and even cancer, so a healthy diet is really important. A great way to know for sure is to take them to your vet. They will be able to tell you the right weight for your dog based on how old and how big they are. full of healthy nutrients that boost your dog’s natural skin barrier. This food is especially for adult Labradors over fifteen months old. The calories have been precisely counted to keep your dog’s weight at the healthiest level. The unique kibble has a shape and texture your dog will love, and can also help them to eat more slowly. This will help stop overeating, while the special recipe satisfies your dog’s hunger. Fish oils in the food provide fatty acids, which support your dog's bones, skin and coat. The mix of nutrients also boosts the natural barrier effect of your pet’s skin. COMPOSITION: maize, rice, dehydrated beef and pork protein*, dehydrated poultry protein, hydrolysed animal proteins, animal fats, vegetable fibres, beet pulp, maize gluten, wheat, yeasts, fish oil, minerals, soya oil, psyllium husks and seeds, fructo-oligo-saccharides, hydrolysed crustaceans (source of glucosamine), borage oil (0.1%), green tea extracts (source of polyphenols), marigold extract (source of lutein), hydrolysed cartilage (source of chondroitin). ADDITIVES (per kg): Nutritional additives: Vitamin A: 28500 IU, Vitamin D3: 800 IU, E1 (Iron): 75 mg, E2 (Iodine): 4.4 mg, E4 (Copper): 5 mg, E5 (Manganese): 56 mg, E6 (Zinc): 190 mg, E8 (Selenium): 0.23 mg - Technological additives: Clinoptilolite of sedimentary origin: 10 g - Preservatives - Antioxidants. ANALYTICALCONSTITUENTS: Protein: 30% - Fat content: 13% - Crude ash: 6.5% - Crude fiber: 3.9% - Per kg: EPA and DHA fatty acids: 4 g. * L.I.P. : protein selected for its very high assimilation. This is my second dog fed on this and both have been strong healthy dogs. Service and delivery excellent. Have been feeding Royal Canin Labarador to both my boys since they were born. They have beautiful shiny coats and great constitutions - no messy poo to pick up ! They love it which is the most important thing. Smells appetising. Large doughnut shaped chunks mean greedy Labradors can't gobble so fast. Sid's coat has improved greatly especially as he goes swimming regularly. Sid is a typical lab who bolts his food and then brings it back again as it can't all go down at once. I use a special bowl that slows him down, I would recommend this food for all labs especially as it helps with Wright control.